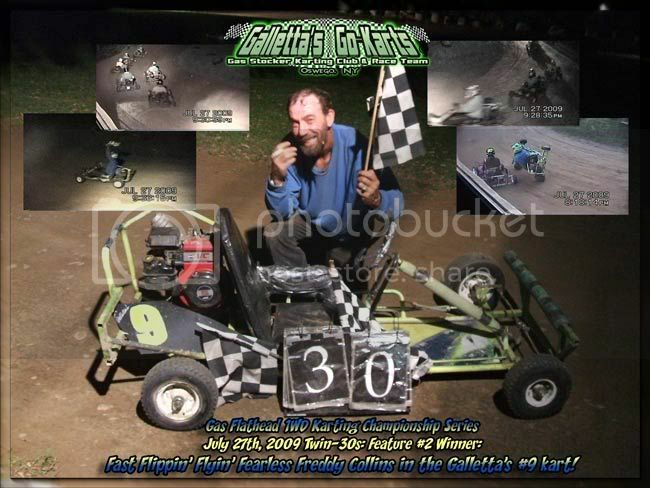 Fred Collins after his historic first feature win on 7/27/2009, after he came back from a wild flip in the first 30-lap feature of the night, shook it off, and then led the majority of the second 30-lapper in the Galletta's #9! Five years of winless racing, wild accidents, and close calls with victory lane falling short finally paid off for Fred! Fearlessly Fast Flippin' Freddie, Wild-man, Wild Werewolf, Bionic Hip Hipster. 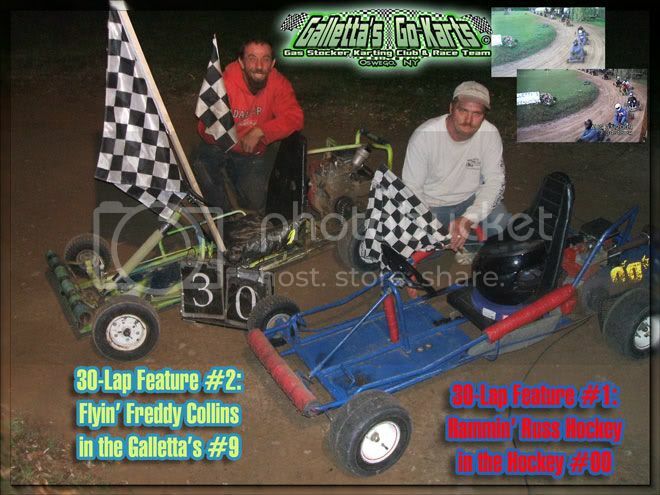 Galletta's Go-Karts #9, #2, #7 or #1. Bought Howard Seabrook's Spongebob Squarepants machine in 2007, but oddly never raced it once anywhere, and had it stolen from him. 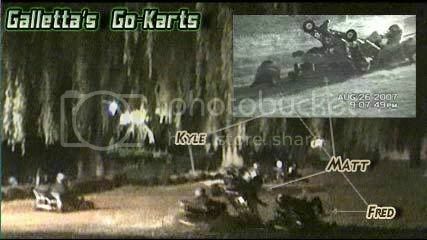 Also bought one of Ed Maynes old karts, but, again, never raced it anywhere and apparently a neighbor burned it and his ex-girlfriend took it from him and tried to sell it to us (which she asked too high of a price for). Poor Fred always has bad luck! Well, at least he won some races in 2009! 2004-current (sporadic because he can't afford parts and gas money). Fred's career highlight to date was on 7/29/2009 as seen in this YouTube video, where he flipped in the first 30-lap feature, yet came back and won the second 30-lap feature - his career first after five long years of racing! Won in 2009. Led a large portion of the 2005 Klassic. Finished well in 2005 and 2006 Klassics. Excellent attendance until he broke his hip in an off-season snowmobile accident. Always finishes well in the Point Standings. All-Time Career leader in flips. Still seeking his first win. Galletta's All-Time Leader of most career races without a single win of any kind, heat or feature before 2009. Fred would race more if he had more money or sponsors. Visually, the worst wreck at Galletta's. More here-->. 70 green-flag laps, 13 karts, and two feature winners were in store for Monday, August 31st, 2009 - a Twin-30s Night! Rapid Rollin' Russell Hockey took the first feature of the night, followed by Furiously Fast Fred Collins taking the second. 2006/09/23 before the 150-lap 2006 Klassic - Photo by Gene Galletta, Prepared by Chris Stevens. Fred's wife' passed away in the winter of 2008. Visit this message board thread to view well-wishes and prayers.